If you’re a business owner, hopefully you’ve been using Google My Business to control how your website appears in search – managing your contact details, opening hours, photos and encouraging customers to leave you reviews. Doing so will make the Knowledge Panel for your business (the information box that appears on the right-hand side of search results) much more informative. 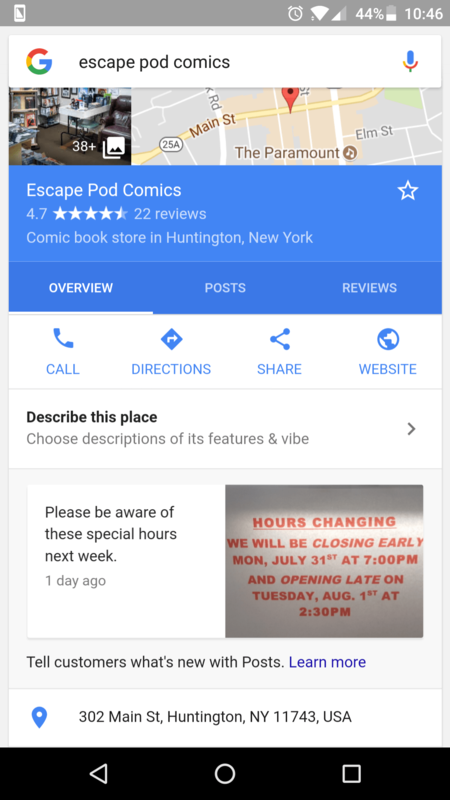 Now a new feature has been incorporated into Google My Business, called Google Posts. And you should definitely consider using them. What are Google Posts and How do they Work? In this example, the company has published a post to tell viewers that they will be using different opening hours in the following week. Google Posts appear in both search and map results, and can include photos as well as text (as in the example above). They can be considered as an additional channel to post updates, alongside your website and social media pages. Anyone who clicks on a Google Post will then have the option to share that post via email, Twitter, Facebook or Google+. 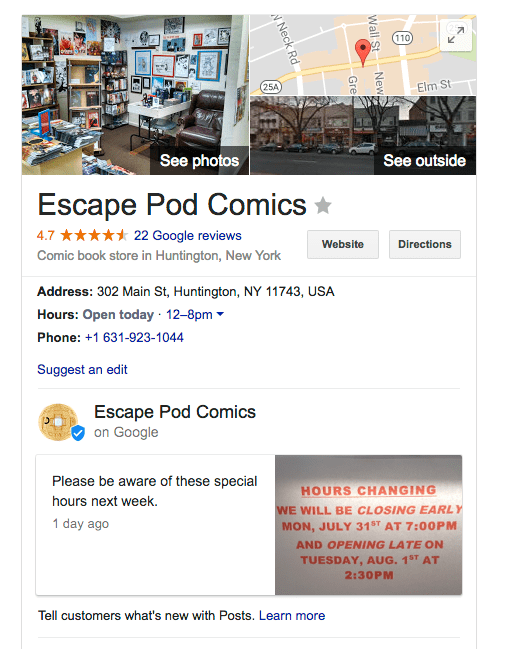 What are the Advantages of Using Google Posts for Small Businesses? 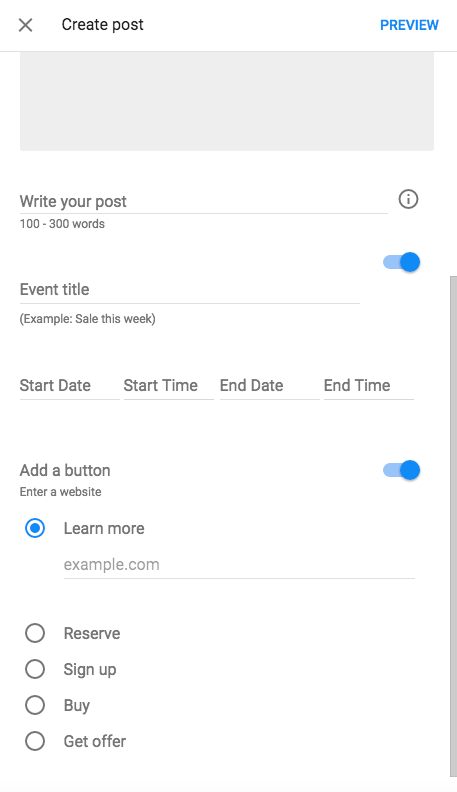 Google Posts are very easy to create, as we’ll see in the next section, and they are published almost instantly. For free. Their principal advantage, of course, is that they allow you to push a marketing message direct from your business listing, allowing you to bring something directly to the attention of searchers. And you can embed a call to action into the post, to encourage people to take your desired action immediately. Pretty neat right? And all before that person has even got to your website. I’m Keen. Is There Anything to Consider Before I Start Posting? The main thing to be aware of is that each post only has a shelf life of seven days, after which it will disappear from the Knowledge Panel. The exception being an event for which you set a start and end date – in that case, the post expires after the end date passes. Posts must be a minimum of 100 words and a maximum of 300 words. That said, only the first 100 words appear in the Knowledge Panel, so you need to ensure that those first 100 words say everything that you need to attract someone’s interest. Depending on the industry your business is in, you may not be able to create a Google Post. The vast majority of industries are eligible, but a select few (such as B&Bs) are not yet included. Two other things to note: you can’t post a video or a gif, as the photo attachment has to be a static image. And you can publish multiple posts – up to ten, which will then display as a carousel. How do I Create a Google Post? With all that done, click Preview to see how it will appear – and if you’re happy with it, click Publish. Your post should then appear in the Knowledge Panel more or less instantly. It’s just as simple to post from your mobile, using the Google My Business app. Go the Posts in the menu bar and then click either ‘Post now’ or the pink icon in the bottom-right to get started. From this point the process is identical to desktop. How Will I Know if my Post is Working? Google has created some very simple analytics for Posts, which you can view by clicking the posts in question in your Google My Business account. The insights are limited to how many views each post got, and how many button clicks were generated for the calls to action. Data also has a lag of around 48 hours. Expect these insights to become more sophisticated shortly. In the meantime, if you wanted greater insight you could always tag your URLs with utm codes, so that you can segment Post traffic in your Google Analytics account, or use voucher codes specific to your Google Posts. Aim to make your images 750×750 and centre-align them. The minimum image size you can use is 250×250, though an image that small won’t look great. Keep the tone personal, fun and reflective of your business. Google Posts are a great way for small businesses to communicate in a way that reflects their personality, in a way that corporates can’t do so easily. Don’t be too concerned about keyword optimisation – and definitely don’t overuse keywords and make your description sound unnatural. Don’t make all your posts promotional; include some that are purely informational in nature, as you would in a blog or on your social media pages. And for those posts that are promotional, don’t be spammy and don’t treat it purely as an advert to get sales. Was this useful? Have you created a Google Post using Google My Business, or are you now thinking about doing so? We want to hear from you, so let us know by leaving a comment below. Should I Talk In My Business Video?